As had become the custom with us, we got a late start to the day. We had a long lunch at the Hinterland restaurant in Perth’s city center while Tim and I began to tally up our trip expenditures, and just how much we had left in our budget. All the remaining major items, such as flights and housing were paid for. However, our spending money was starting to get pretty low. We would have to be more discerning with our expenditures during the last few days of the trip. We spent the remainder of our afternoon driving north into the Scottish Highlands. 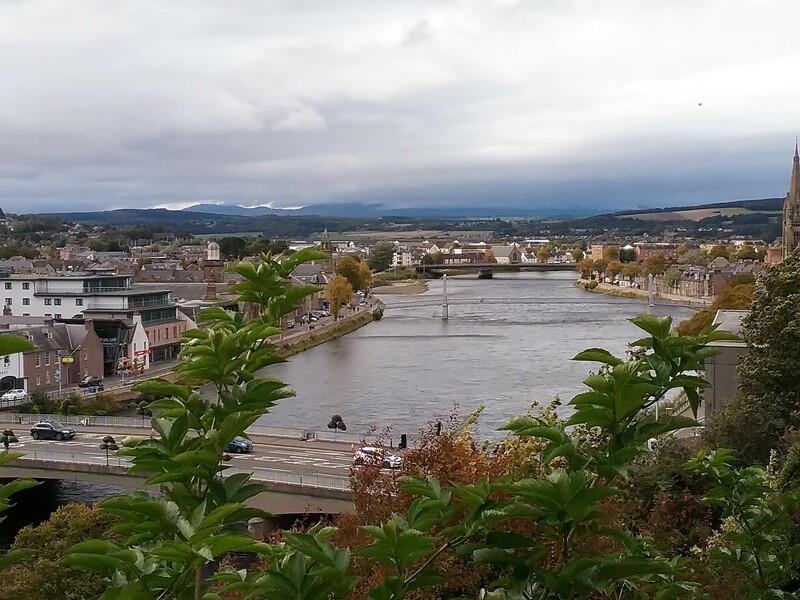 Our ultimate destination was the city of Inverness. After some initial confusion, we finally located our host house in the heart of the city. 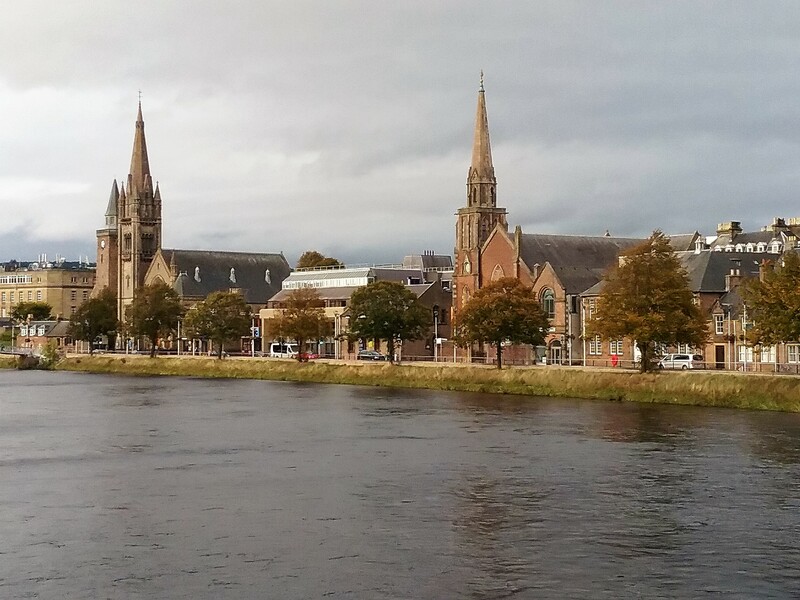 After getting squared away, we did a walking tour of Inverness. This was no easy feat due to the continual gusts of wind that almost seemed to blow at us from every direction. 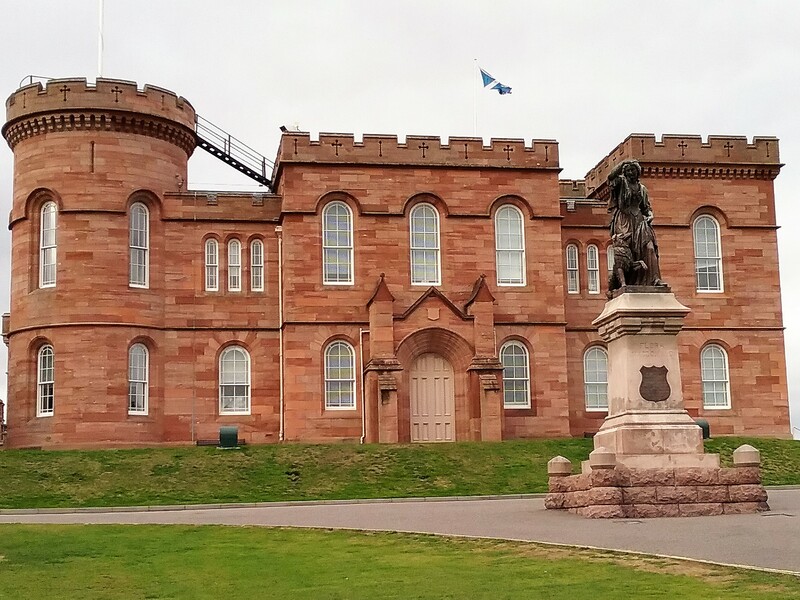 Despite this, we tramped uphill to Inverness Castle, which, compared to some of the surrounding structures in town, looked positively new. Actually, for European standards (the existing castle was only about 180-190 years old), it practically was. Like a lot of the buildings we had encountered on the trip thus far, the castle in its many incarnations, had a long and bloody history of invasion and destruction. Unfortunately, the castle had closed for the evening, but the scenic overlook beyond the hill we were on was something to behold. . The beautiful River Ness flowed through the city below us, in much the same way that the Fox River curved through my hometown. The trees around us were just beginning to hint at the colors of the coming autumn. Ancient church spires and towers rose grandly from among the more modern buildings.